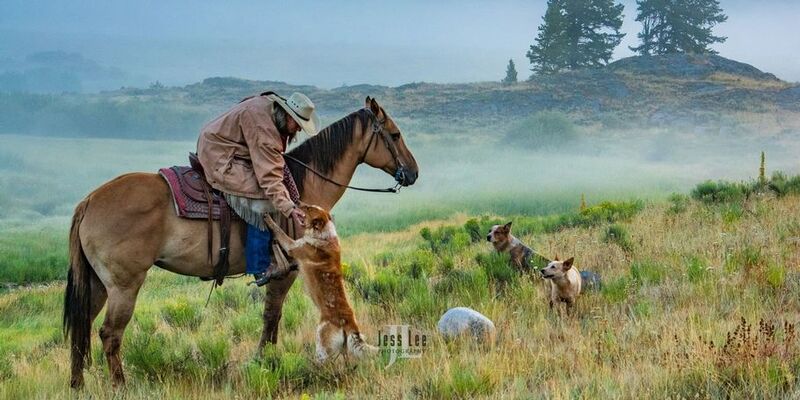 This cowboy and wild horse workshop brings you to one of the most photogenic ranch locations in the west. 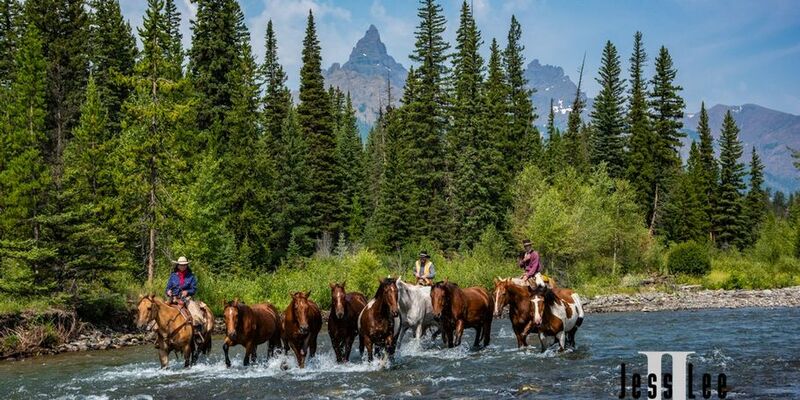 The cowboys and their ranches are authentic and the horses are truly wild. 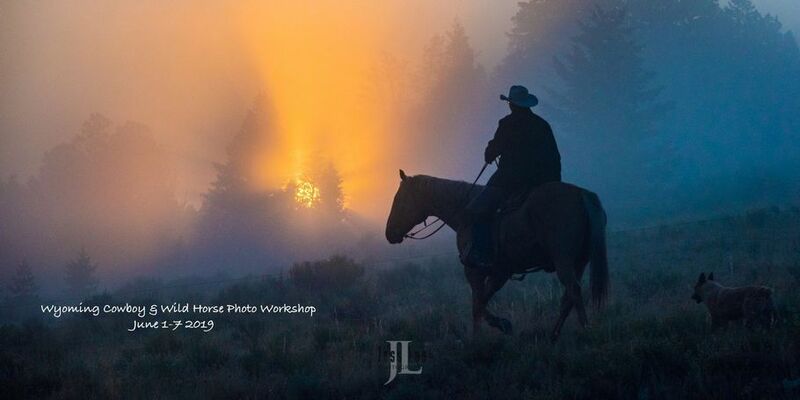 This workshop will take you to some of the most scenic country in the west, the beautiful country near the historic town of Cody Wyoming. On this trip the first part of your workshop will be in the Beartooth Mountains along the Wyoming/Montana state line just east of Yellowstone National Park. Here you will photograph working cowboys riding broncs, roping, working cattle and going about their daily chores with a backdrop of the Beartooth Mountains along the Wyoming/Montana line at several ranches nestled between the lofty peaks of one of the most scenic mountain ranges in North America While we are in the high country where the west still lives, you will be staying at a private guest ranch nested among the timber. Each morning after a hot breakfast prepared on our schedule at the ranch we will head out to a unique location to catch the pre dawn light and the mornings activities. The morning will pass quickly and your flash cards will fill with scenes that surpass an epic western move. Each location and the activity is selected by Jess and the crew with careful planning to ensure the best and most unique images. 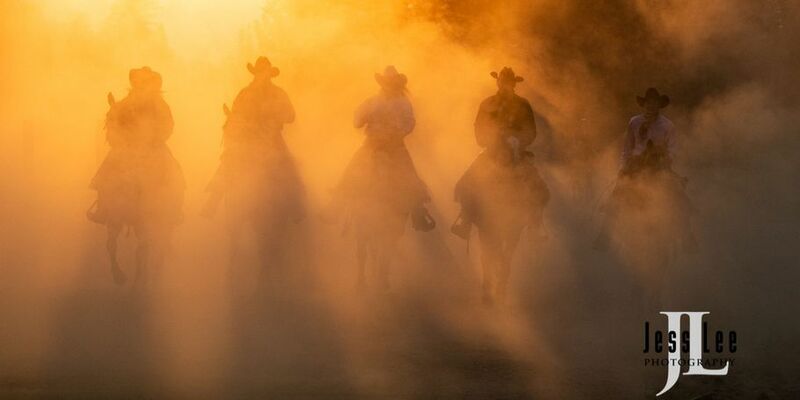 Not only will we have a group of wranglers that are experienced cowboys and cowgirls, we will have cattle in the high country, bucking broncs with historic corrals, barns, ranch buildings, round ups and roping's. As the morning light turns harsh and the activities are over we will return to the ranch where lunch will be waiting. After lunch you will be free to take part in ranch activities for a couple of hours on your own. 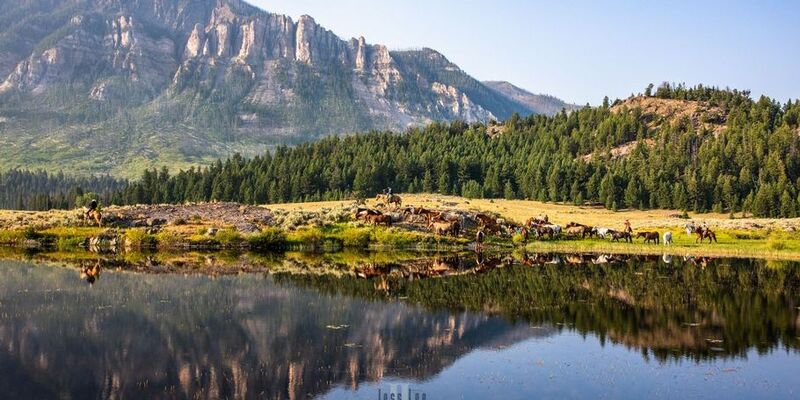 Possibilities include horseback riding, guided fishing or just relaxing in the beautiful Wyoming high country. We will also offer session on image processing and a private image critic. After our break we will head out again to capture more cowboy and ranch work in a location selected for awe inspiring scenery in sweet evening light. When the light is gone we will be back at the ranch where our dinner will be prepared and we can return to our cabins to prepare for tomorrow activities. Our next stop on this great workshop will be the charming western town of Cody Wyoming named after it's founder, Buffalo Bill Cody. Cody is a great location with many sights and scenes to photograph. 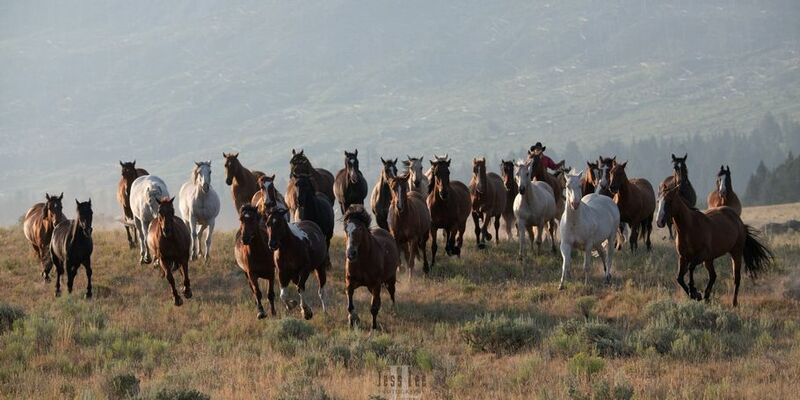 Cody will be our base for our dawn and dusk excursions into the famous McCullough Peaks Wild Horse Management area. This area has just been opened to legal Wild Horse photo workshops and has been one of our favorite locations for our photography for many years. The McCullough horses are one of the most photogenic of all the wild horse band we have found in the west with great color variation and beautiful western backgrounds. June 1st. Our trip begins in Cody Wyoming where we will meet by 2 P.M. to head out to the high country of the Beartooth Mountains. The scenic drive will take us over Sleeping Indian pass where stopping to enjoy and photograph the vista that lies ahead is a must. After our arrival and unpacking at the K BAR Z we will have a orientation and instruction session on how to safely catch the fast action of the Cowboy life. Dinner will be family style at the K BAR Z where our cowboys will join us for a introduction to the next days activities. As the light begins to soften we will have our first cowboy photo shot with the background of the dramatic cliffs and mountains that surround this hidden jewel. The 2nd and 3rd you will be saturated with working cowboys, ranches, horses and cattle all surrounded by views seen in very few places. There will be a mid day session on how to process you images. You will also have the opportunity to have a private image critique session with Jess. June 4th after a brief morning modeling and still life shoot and breakfast at the K BAR Z we will return to Cody and get settled in our rooms. 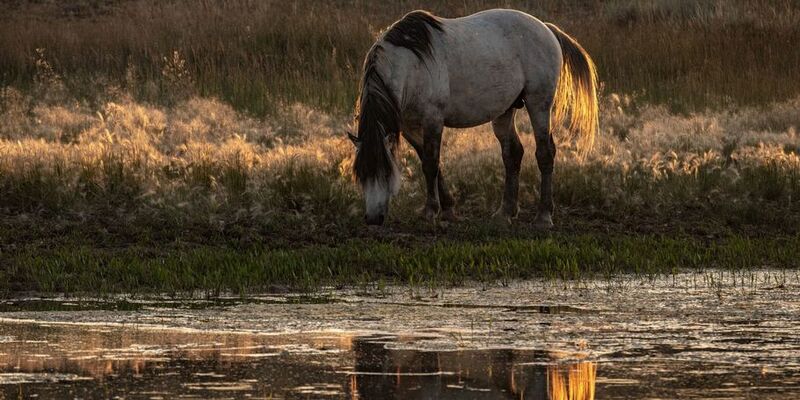 After a early dinner will head directly to the Wild Horse Range to find the beautiful Mustangs of McCullough Peaks where we will photograph until the light is gone. 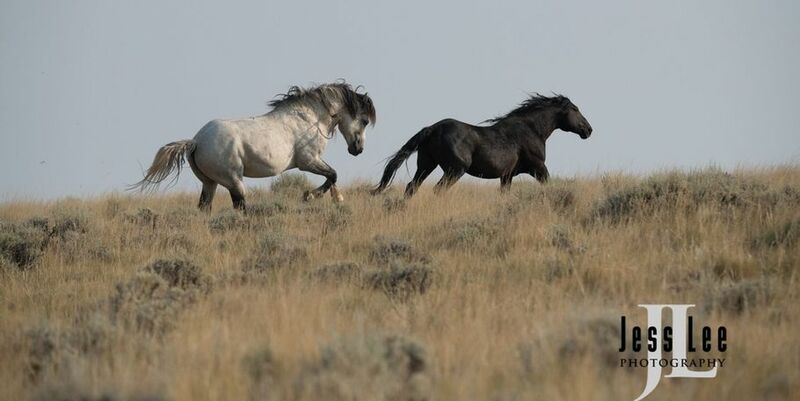 June 5th and 6th we will leave Cody well before dawn to search for the horses and capture their spirit with your images. 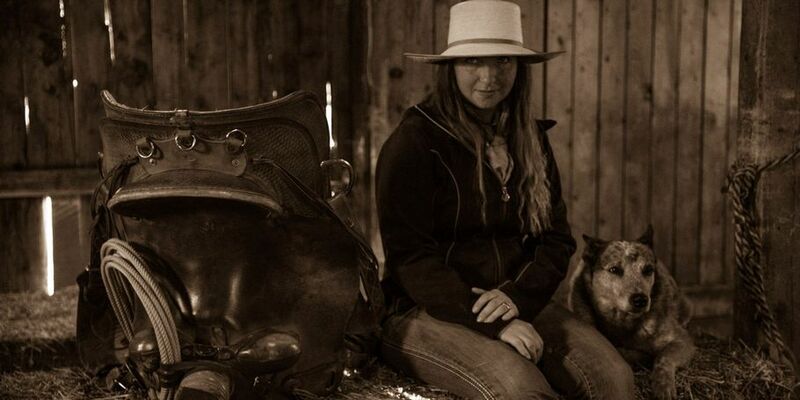 Jess will give you insight into the herd behavior of the horses they have dedicated many years to photographing. 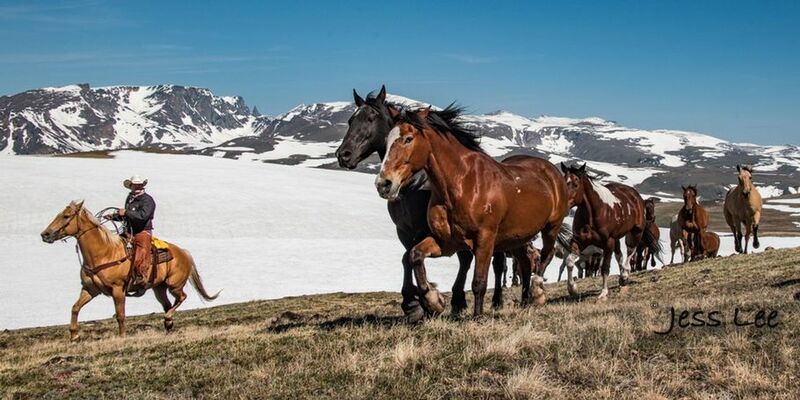 We will put you in the best position to to photograph and witness these unique creature as they go about their normal routine of interaction between the various herd, the lead stallions and the bachelor bands. Around noon we will be back in Cody for lunch and a well deserved break. Mid day will give you a chance to review your mornings work, recharge your batteries and visit the great Cody western museum on your own if you wish. Jess will be available to review images, critic and give processing suggestions. The afternoon session will begin with a early dinner and back to the wild horse ranges until last light. The morning of the 7th we will again leave Cody well before dawn to search for the wild horses for on last chance to capture the flavor of this piece of the west. At 11 we will check out of our rooms. After a quick stop for lunch and say farewell until next time. Transposition can be provided to and from the Cody airport. Price $3495 double. Single Supplement, $450. Price includes guiding, lodging, instruction, ranch fees, model fees. Meals, items of a personal nature and tips for guides and models are not included in the price. GROUP MINIMUM: Occasionally I am able to run a trip below our group minimum which is generally 3. In such instances it may be necessary to apply a small group supplement. You would be contacted regarding such a situation but you would not be obligated to accept the new terms. RESERVATIONS: Your $ 500 deposit is required to secure your place on any trip, with the balance due120 days prior to the departure date. CANCELLATIONS: All cancellations must be confirmed in writing, and due to costs incurred by Jess Lee Photos in arranging a tour, deposits are non refundable. Payment in full is required 120 days prior to departure. Cancellations after 120 days will receive a full refund( except deposit) if your spot can be filled from a waiting list or if you can fill your spot. JessLeePhotos LLC strongly suggest that tour participants invest in trip cancellation insurance. LUGGAGE: JessLeePhotos request that tour participants limit their luggage to the equivalent of one suitcase, one flight bag, one camera bag and tripod. We asks that group members bear in mind space and comfort in our vehicles. All personal luggage is the responsibility of the owner so please keep the weight to a limit YOU can handle and other restrictions can be met. RESPONSIBILITY: JessLeePhotos LLC and its agents act only as agents for the passenger in all matters relating to travel arrangements, and as such, do not assume responsibility for injury, accident, damage, loss, delay or irregularity which may occur via defect of transportation or any other cause. JessLeePhotos reserves the right to substitute hotels, and other previously outlined arrangements as necessary, to either improve or equal the travel experience. JessLeePhotos reserves the right to pass on to tour members any additional and unplanned expenditures incurred during the tour, via events beyond JessLeePhotos' control. Payment of tour fees by trip participants constitutes their acceptance of all conditions contained herein including but not limited to injury, death or other liability incurred during a trip..